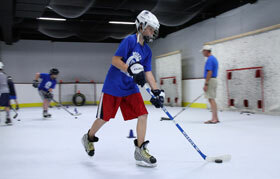 Now in our 16th year, we are offering both on and off ice hockey skill development. Watch a highlight video to learn more. We offer programs for Mites through Midgets as well as elite training at the junior, collegiate and NHL levels. Experience the Hockey University training system. Our method provides every player with the knowledge and physical skills to succeed at any level. 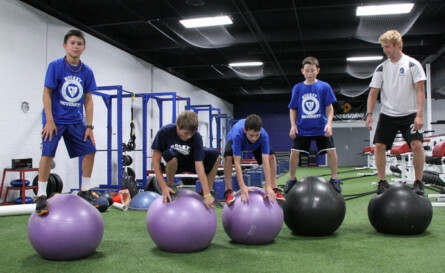 Our curriculum provides students with the opportunity to improve their skills and overall fitness with the skating treadmill, strength and conditioning, agility training, stickhandling and shooting and more. Our fully qualified staff includes professional hockey players, elite trainers from the USA NTDP and coaches who believe in helping their students to succeed! Over my years of coaching, I can say without hesitation, it is easy to identify the players who attended Hockey U over the summer. Beyond the players returning to their team already conditioned, they are simply the better technical skaters on the team. Skating is the most fundamental critical skill in the game. A strong skater has an immediate advantage over their opponent. Further, Hockey U trained players are the harder working athletes, because they have higher expectations for themselves and their team! Another fantastic summer for my son, driven by the special character and the discipline of your program. Hockey U has transformed him and our summer experiences in more positive ways than it is possible to articulate. The benefits are truly immeasurable, the coaches are amazing role models, and I cannot thank you enough for putting together this unique program. We are so lucky to live in Ann Arbor, and Ann Arbor is so lucky to have people like you here! There are no other programs that compare to Hockey U! Both of our boys started with the program when they were in preschool, and they continue to be challenged each summer. 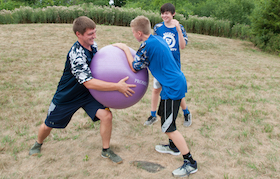 Our oldest is a bantam and he loves having the weight training and classroom sessions added to the ice training. Our youngest is a squirt and he’s really motivated with the treadmill and off-ice training. The variety of training and the talented staff are key components to the success of Hockey U. We also use Hockey U’s resources throughout the hockey season as well. Treadmill and stickhandling sessions are picked up whenever our schedule permits. We’re very happy with the program and the impact it continues to have on our boys…and best of all...the boys love it! Last summer, Sam participated in the Hockey University program at the Cube. 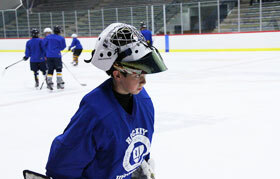 He made terrific strides in his speed, strength, stick-handling and shooting – all while having a great time! Sam is continuing to work with the coaches on the ice during his hockey season. They are helping him to continue to improve his on ice skills and also gain the "hockey tough" mind skills to excel at the game – Thanks to Carrie and the other instructors at Hockey University.